Harvey’s heroes: America at its best? 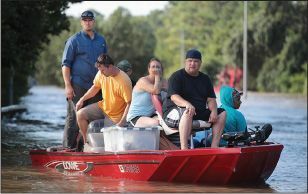 Not to “diminish the bighearted men and women who rose to the occasion,” said Katy Waldman in Slate.com, but during disasters, displays of compassion and selflessness are fairly common, according to social scientists. Hurricanes, tornadoes, earthquakes, fires—they all feel “mythic,” and heighten people’s sense of community and heroism. Harvey didn’t reveal the “best of America”; it was “a beautiful anomaly” that showed a “contingent America, a ‘paradise’ specific to the ‘hell’ around it.” When the floodwaters recede, expect Houston’s “cooperative society” to vanish with them, and the usual divisions of race, ethnicity, class, and partisan loyalty to return, as survivors compete for disaster aid and scarce resources.